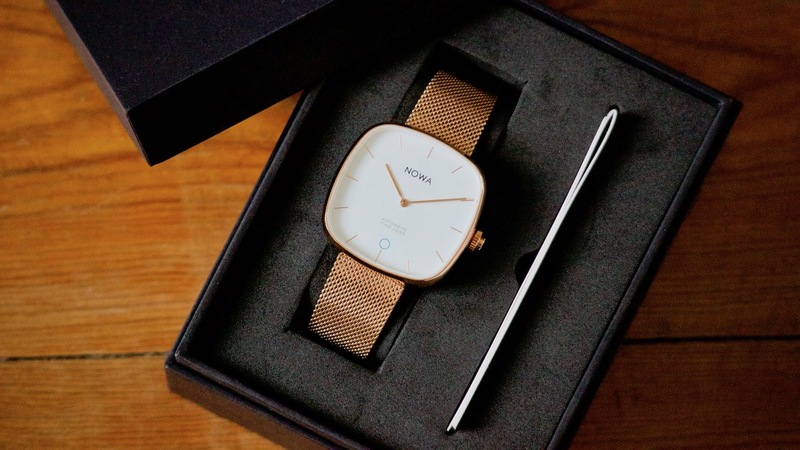 Fossil and Kronaby may be the big dogs in the world of hybrid smartwatches, but Nowa's first hybrid, the Shaper, was a skinny and stylish alternative that we enjoyed. It also did really well on Kickstarter. Nowa is now back at it again with the Superbe, another skinny hybrid that changes the style up a bit. Rather than go with a 40mm circular watch face like on the Shaper, Nowa opted for a 36mm square face. As it's a little smaller, it's a bit of a better unisex option too. As for smarts, the same features that featured on the Shaper are here. You'll get activity tracking, sleep tracking, smart controls that allow you to take control your camera, Google Fit and Apple Health compatibility, find my phone and automatic time zone adjustment. The Superbe has a stainless steel case that's 10mm thick, with a mineral glass with sapphire coating covering that watch face. You'll be able to swap out 18mm straps should you want to switch away from the default Italian leather or Milanese mesh. As for the timekeeping aspect, it's running a Swiss Partz Quartz movement. Finally, it's water resistance for splashes only, so you're not going to be able to swim with it. As for battery life, you'll get 8 months in smart mode on its CR2025 battery. If you don't use smart mode, you'll get two years. Like with the Shaper, you'll need to take your watch to a qualified pro to switch out the battery - unless you have the battery replacement tools and know-how to do it yourself. The total collection comes with six options: A silver case with a white face and black strap, a rose gold case with black face and black strap, a black case with a white face and brown strap, a rose gold case with a white face and rose gold mesh strap, a silver case with white face and silver mesh strap, and a black case with black face and black leather strap. The Superbe has already hit Nowa's $16,000 Kickstarter goal, nabbing $23,720 with plenty of time to go. You'll be able to snag one at an early bird price of €99, which is around £85 - that's 48% off its full price. Estimated delivery is August.